Shogetsu Grand Hotel is about 50 minutes from the JR Sapporo Station. We flew in from Tokyo and landed at New Chitose Airport, a 1.5 hours drive. It is best to rent a car when exploring Hokkaido. The major sights are significantly far from each other, so unless you are with a tour bus, waiting for public buses might not be your best use to time. Each room offered a view of the gorge and a mountain of green. I think fall would be ideal and even more beautiful. Imagine all the golden tones mixed with reds. 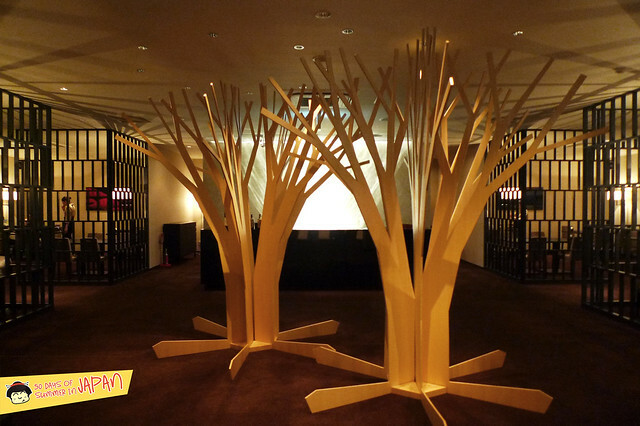 The hotel is surrounded by nature. Jozan park and nature trails are minutes away and ideal for short walks, feet soaking in the natural hot spring and enjoying the fresh air. After living in the city, this was such a treat. 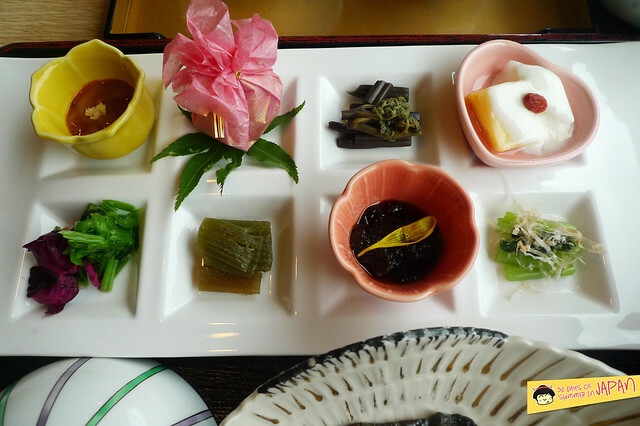 As we entered our room we were greeted by the matcha green tea and a azuki bean paste filled pancake like sweet. It’s always nice to be welcomed this way. The baths areas are very clean and serene. Perfect after a long day out, or just staying in and letting all the sores and worries wash away. I loved the outdoor bath in the natural setting. Just make sure you follow the rules and clean yourself completely before submerging into this warm oasis. After all, it is communal. We opted for traditional Japanese style rooms. At night, they bring in tatami mats. The whole experience is relaxing all the way to the attire. No need to dress up for dinner or anything for that matter. We wore our Yukata (cotton kimonos) within the hotel like locals. I loved waking up in the morning and heading to breakfast with such minimal effort. During our stay, we got the occasional fireworks at night. A wonderful surprise from our windows. The gorge’s flowing water made a soothing melody all night long. Peaceful and restful sleep was almost guaranteed. Over 20 different types of honey, fresh from Hokkaido. A medley of colors and unique flavors. I liked them on crackers with a cup of tea, but yogurt was also available. After a few different ones, anyone’s palate would feel overwhelmed in a sweet way. I can’t tell you which I liked best, but overall it was a fun experience. Dinner times are scheduled in advance, so everything was always set and ready whenever we arrived. Our first night, we were pleasantly surprised by this lovely beginning to our seasonal meal prepared by Master Chef Fujii. Each of us got a nabe, boiling at the table. Hearty and healthy pot of meatballs with organic vegetables in a soy broth. Very clean, drawing sweetness naturally. I loved the crunchy soft bone mixed into the pork meatballs. The texture is so playful. Fresh sashimi. Squid with shiso is a favorite of mine. Tender, slightly chewy with a bright grassy and minty finish. Simple salad with fresh ingredients. 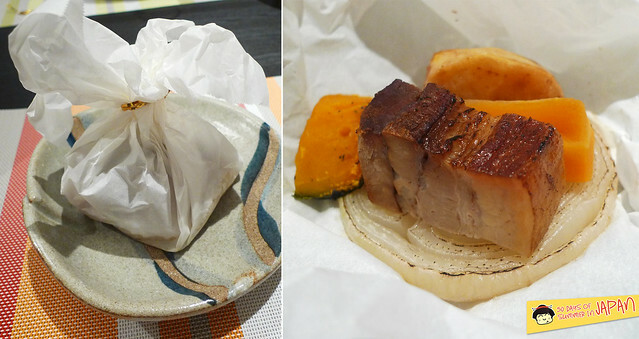 Pork belly and root vegetables. Hokkaido uni chawanmushi. Warm savory egg custard topped with what I call “mayo of the ocean”. The uni here is sweet and less briny than the California ones. I adore the rice in Japan and at this point of my trip, I had already consumed more than a year’s worth. The rice here is cooked at the beginning of our meal – table side. The result are plump, fluffy and glossy grains with just enough quality of a sticky rice without getting mushy. The seaweed added a bit of earthy saltiness. Rice is usually enjoyed with clear broth on the side or poured over and some pickles to liven between bites. 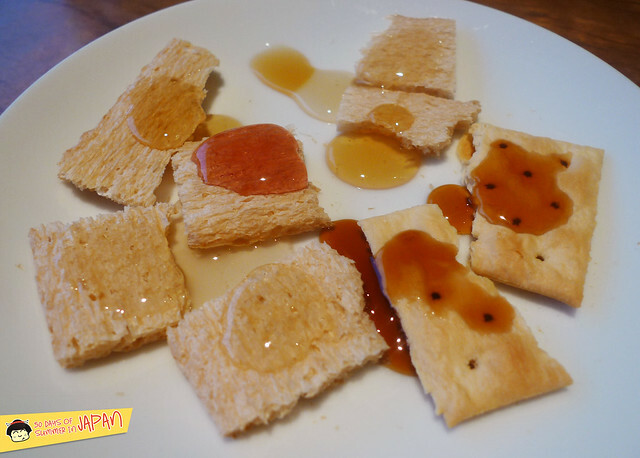 It ends the meal in a way that it comforts the tummy, similar to a warm hug from a teddy bear. Among the desserts, this non-alcoholic melon jello was my favorite. Refreshing on a hot summer night. Definitely more lavish and intricate than any breakfast or brunch in NY. I loved waking up to this. 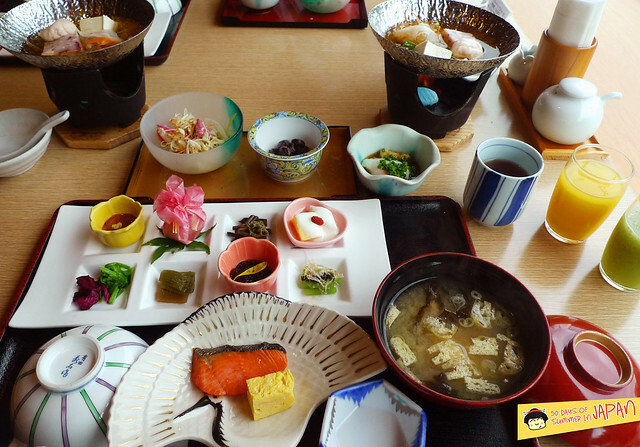 On different mornings, we had tofu broths with vegetables and different grilled fish options. Garden on a plate – the different ways each vegetable was prepared and the play on colors and presentation. Sweet soy braised daikon, one of my favorite bites. The daikon acts like a sponge, absorbing all the juices. Wrapping our own little bites. The seaweed is crisp and full of sesame flavor. 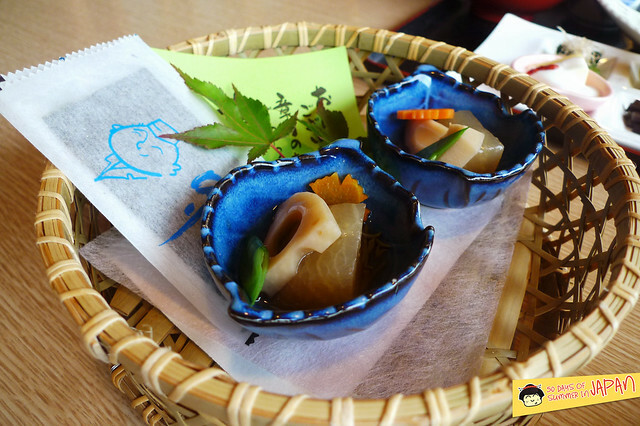 We spent a whole day in Otaru, so only 2 dinners during our long weekend stay. Another surprise in presentation. 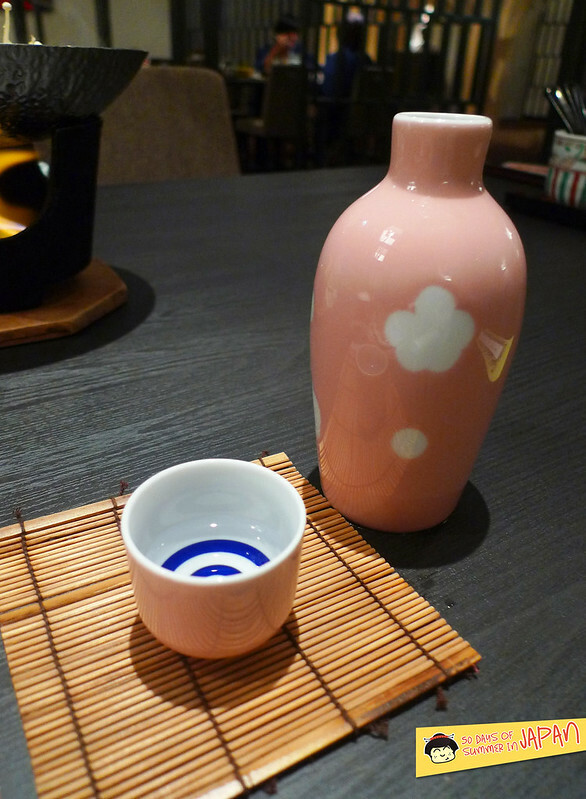 And of course sweet plum wine to open our appetite, though honestly, I never need help in that department. I’m not sure what this is called in English, but we eat it in Shanghai. It’s sort of like jelly fish but with a harder crunch. We call it “rock jelly fish” and usually dip it in soy and sesame, I really like it, but it’s not for everyone. Best described as chewing the ocean. Texture wise, it’s like tendon and soft bone in one bite. Chef Fujii’s specialty. 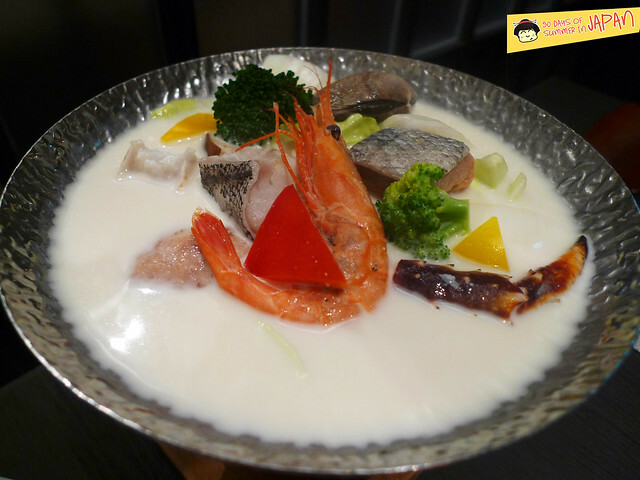 A nabe with a broth made from fresh milk, cream and white miso. Loaded with fresh seafood and vegetables. The broth is so smooth and velvety. The richness and sweetness of the ingredients season the broth as it cooks. So good and umami filled. This was by far one of my favorite dishes. The shrimp was filled with roe. The meat was extra firm and sweet. An array of courses in between. The roast beef wasn’t stellar but they made up for it in the form of a whole uni. As much as I love sashimi, the head to tail presentation didn’t tickle my appetite at all. But, the fish was very fresh. Prettiest presentation of an edible cherry blossom tree. It was basically fried colorful rice puffs on seaweed branches. The cold mushy dish on the left got lost in translation, but another wonderful rice bowl to end an elaborate dinner. This one had pickled vegetables. Sweet and tart. Yubari Melons are unique to Hokkaido. These cantaloupe hybrids are one of the most expensive melons in the world. I’m not sure these were top quality, I highly doubt it based on the insane prices. Regardless, this was one of the sweetest with the most concentrated flavors ever, like cantaloupe on steroids. 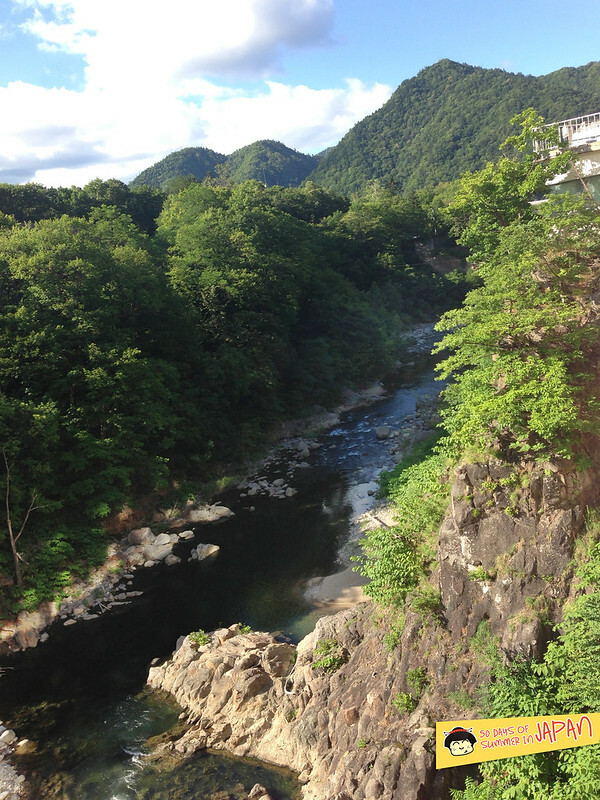 A short walk from the hotel, the Jozan Gensen Park is a nice little walk enhanced by a foot bath, hot spring falls, trail along wild plants and a bath with water temperates reaching eggs boiling levels. Soaking the feet feels great, though I would recommend coming here during colder months. Summer was hot! Monk Jozan sits on top of a rock, surrounded by natural steam. When the sun hits, it’s a very lively visual. Across from the hotel, a small shop run by sweet Japanese ladies turn out these all natural azuki bean paste filled buns. The exterior is a cross between a steam bun and pancake with tongue caressing mineral finish – I’m guessing from the free flowing hot spring water. In it’s center, the sweet red bean has a clear signs of sugar, but like most Asian desserts, it is toned down compared to Western sweets. We wanted to buy extra to bring home, but due to the lack of preservatives, shelf life was very short. I really loved our time in the hotel and it’s natural surroundings. We bought some of the best cherries at the nearby Shinohara fruit farm, visited Hoheikyo Dam, spent a day in Otaru and drove all the way to Furano for the lavender fields and Blue Pond. All our senses were pampered daily. Highly recommend it. 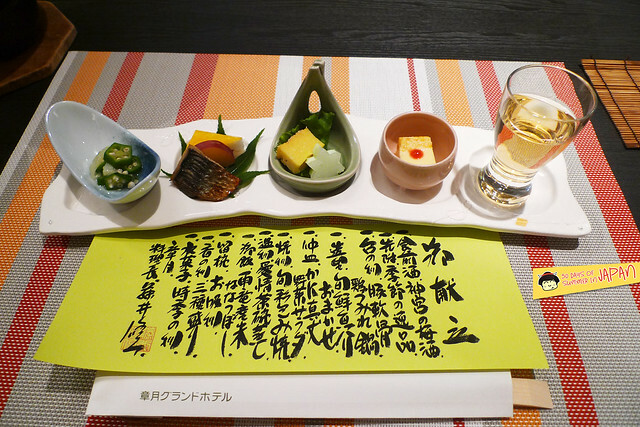 HOKKAIDO Shogetsu Grand Hotel: Seasonal Menu & Natural Hot Spring.